A version of this paper was presented as part of the 7th annual Municipal Finance Conference, held July 16-17, 2018 at Brookings. Although state and local governments in the U.S. have historically been regarded as some of the most financially sound entities, the aftermath of the Great Recession has cast doubt on this notion. The financial crisis also led to the collapse of most bond insurance companies, leaving the vast majority of obligations of state and local governments uninsured. At the same time, unmet needs for infrastructure investments, the bulk of which are typically funded by state and local governments, have been growing and estimated to amount to approximately $2 trillion in 2017.1 In the presence of these funding shortfalls, municipal entities have rapidly increased their reliance on private bank loans. Specifically, state and local governments have increased their bank loan obligations from about $30 billion before the financial crisis to over $160 billion in late 2016 (see Figure 1). Yet empirical evidence on this trend has been nonexistent. No disclosure requirements exist for private debt claims of municipal governments, and very few municipal entities choose to disclose voluntarily.2 Using confidential supervisory loan-level data on bank lending to municipal governments in the United States, Ivan Ivanov of Federal Reserve Board and Tom Zimmermann of University of Cologne study the municipal bank debt market. They first present key characteristics of the average bank loan contract to municipalities and discuss implications for debt seniority and potential claim dilution between private and public debt claims; then analyze banks’ internal assessment of the credit worthiness of municipalities and draw comparisons with that of rating agencies. Lastly, they study how exogenous adverse income shocks affect the debt structure of municipalities. This analysis helps understand whether the trend towards private debt claims is likely to persist in an environment of eroding fiscal positions. They show that most of bank lending to states and local governments is done via credit lines, terms loans, and to a lesser extent leases.3 The majority of bank borrowing of counties, cities, and districts (both in terms of counts and funded amounts) is done via term loans. In contrast, states that have bank borrowing exhibit greater reliance on credit lines than local governments such as counties, cities, and districts. Additionally, municipal governments may have substantial additional ability to increase debt in a short time frame because of large unused revolving credit capacity. 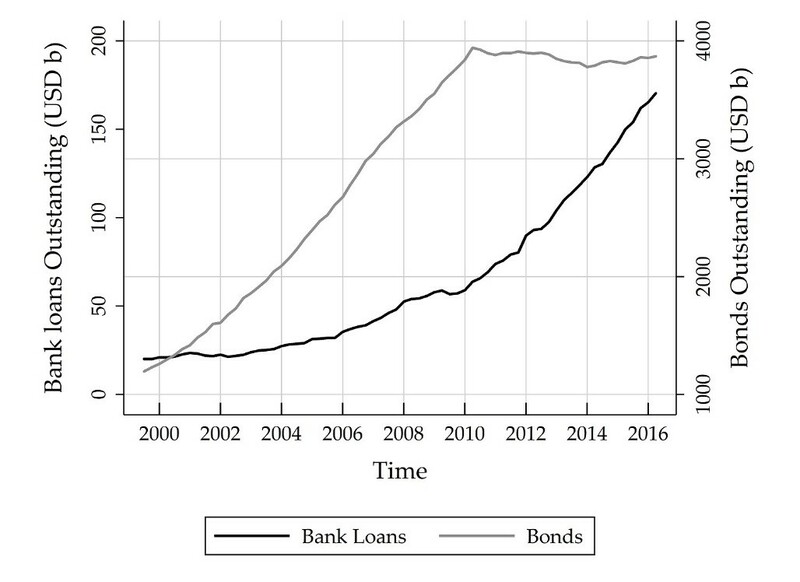 The paper further demonstrates bank lending to state and local governments is heavily collateralized, has high contractual priority, and contains additional guarantees. For example, 60 percent of lines of credit and 80 percent of term loans are secured, with banks almost always having first-lien priority on the assets that secure the loans. Whenever a bank loan is unsecured, banks are almost always senior in terms of priority. In addition, bank loan maturities are short: only 2-3 years for lines of credit and 7-8 years for term loans. Overall, given the high collateralization of bank loans combined with maturities that are likely to be substantially shorter than those of public bonds, state and local governments with outstanding bonds may dilute public bondholders when they issue new bank loans. While such bonds claim dilution through collateralization and shortening of debt maturities may be a way to maximize external finance proceeds given the realization of an adverse income shock,4 it substantially limits the ability of a municipality to take on additional debt. For example, only less than a 100 issuances of bank loans have been reported as compared to the 44,000 state and local issuers (see https://www.sec.gov/rules/proposed/2017/34-80130.pdf and https://www.sec.gov/news/studies/2012/munireport073112.pdf). In addition, a substantial fraction of those documents are so heavily redacted that no information on bank loan interest rates, commitment amounts, maturities, or fees could be obtained. Leases represent only between 12 percent and 16 percent of bank loans in terms of counts and even less in terms of outstanding debt. Other types of lending exposure include demand loans, commercial cards, and bond purchase agreements. It may be optimal ex ante for bond holders to allow for claim dilution if adverse income shocks occur with positive probability.